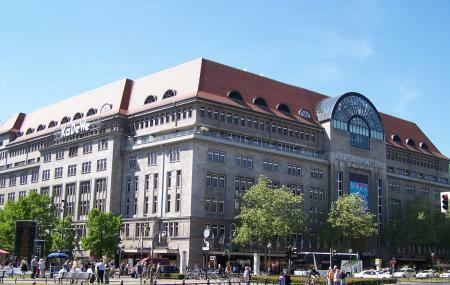 Kaufhaus des Westens is probably the largest departmental store in Central Europe. We are not surprised because it spreads over 60,000 square metres. It is owned by a Thai family and has around 4,00,000 articles and things to choose from. It dates back to 1905, thanks to the Berlin Merchant Kommerzienrat Adolf Jandorf who wanted to try out something new and establish something unconventional. Commonly known as KaDeWe, this store attracts over 1,80,000 visitors from all over the world every day. Once here, you can choose from different sections such as clothing, beauty, fashion and a lot of other ranges. You should also check them out as they are one of the best examples of evolution with time. With an extremely intriguing history, this place has a lot to offer to you. Depends on what you shop. Do check special opening times for holidays. Lines 343, M19, M29 and M46, stop Wittenbergplatz. Lines U1, U2 and U3, stop wittenbergplatz. How popular is Kaufhaus Des Westens? People normally club together Potsdamer Platz and Victory Column while planning their visit to Kaufhaus Des Westens. People also prefer to end their day with Kaufhaus Des Westens. A pricey department store for the wealthy. Its interesting to see how the 1% live and this store gives some insight. Too luxury brands are accompanied by an ample wine food selection. Worth a walk through and for people with more money than sense. The fifth floor of food is amazing. There are restaurants, bars, markets, and food counters for fish, baked goods, coffee, etc. I could have spent hours there. We enjoyed BRLO Chicken and Beer. The pastries at the French bakery were also amazing. The bathroom is on the sixth floor, which didn’t seem to be accessible by elevator. I had to go to the middle area for the escalator. It was clean, but there were three attendants at the door between the women’s and men’s sides, and I felt like they were more in the way than helpful, though they were quite pleasant. The first floor is a freaking madhouse. This is where all the beauty and jewelry products were located. Walking through the cosmetics area, we got a little whiff of something that made me think the baby in the stroller next to us needed changing. As we got deeper in there, it was clear that it wasn’t the baby, but it was an explosion of stench from somewhere within the shop. I have no idea what it was, but the employees didn’t bat an eyelash. We, on the other hand, ran as quickly as possible away from both the stench and the crowd. Unbelievably awesome! The famous KaDeWe. Tons of history behind this fabulous store. You can get almost everything here I am sure. Food courts were delicious, jewelry stores were stunning, coffee counters were amazing, from licorice to baked goods to world class perfumes...this place has it all. I would return here in a heartbeat if it was closer, and this will be the first place I visit when I come back to Berlin, without question. I highly recommend this world class store to everyone. A must to visit here at least once in your life. Enjoy. Superb. A real good shopping place. There you can get almost everything. For good reasons famous for its restaurant part. It's a real institution and part of Berlin's history. Weekend is pretty crowded. Always good to start or end a day in the upper floor restaurant area. Hint: fresh oyster and a glad of champagne. It's not cheap but like always: If you want quality you will have to pay for quality... Go there it'll be a nice visit. Probably very dependent on what you expect. I love that this place is there because it’s so interwoven with Berlin. It has a stunning collection of brands, shops, and a world class food area. It’s just way too big, way to crowded and way to easy to get lost if you’re not out for exactly that. Expensive.